2018. By Allison W. Bell and Maida Goodwin. 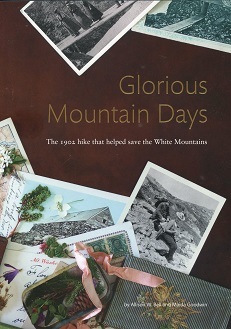 A wonderful new book looking back at a remarkable 1902 adventure in the White Mountains. This profusely illustrated volume brings together the letters and photographs by Hattie Freeman and Emma Cummings made during a week-long tramp across New Hampshire's Presidential Range in July 1902. Their remarkable words and images describe mountain birds, alpine flowers, rugged trails, and camp life enjoyed by the two women and their companions. Inspired by their "glorious" experience, the two women went on to help preserve the White Mountains for future generations through their activism. Softcover. 108 pp.